The Sundara Kanda - the bija-kanda or seed-book of the Ramayana of Valmiki - stands by itself as a rounded epic in its own compelling right. Instinct with diverse 'beauties' (like sabdasaundarya and Kavya-saundarya) and all the nine 'Rasas', the work may be viewed as a marvel of a finished epic with an admirable ordering of parts fusing into an effulgent unity, verily a moving relation of events of abiding racial and human interest. In 'The Epic Beautiful,' Prof. K. R. Srinivasa Iyengar has rendered the complete Sundara Kanda into 2823 unrhymed quatrains divided into 7 Books and 68 Cantos. He has likewise given in verse, as 'Prologue', the traditional account of the genesis of the epic (from the Bala Kanda); and, as 'Epilogue', verse renderings of Aditya Hridayam and 'The Coronation of Rama and Sita' (both from the Yuddha Kanda). These are by tradition meaningful and auspicious ancillaries to the Sundara Kanda. Professor Iyengar has also contributed a long and scholarly Introduction on the Epic tradition in India, the universality of the appeal of the Ramayana, the centrality and beauty of the 'Sundara Kanda', the fascination it exercises on men, women and children, and on the problem of translating the Ramayana from the original Sanskrit into English. Professor Iyengar's 'Notes and Comments', again, are a help towards the understanding and appreciation of the 'Sundara Kanda' or 'The Epic Beautiful'. M. R. Srinivasa Iyengar (b. 1908), M. A., D. Litt. (Madras), was successively Professor of English at Andhra University (1947-66), its Vice-Chancellor (1966-68), Vice-President (1969-77), and Acting President (1977-78) of Sahitya Akademi. He has served as member of the Press Council of India, the Board of Governors of the Indian Institute of Advanced Study (Simla) and CIEFL (Hyderabad), and the Executive of the P. E. N. All-India Centre. He has participated in several conferences in India and abroad, and has received the D. Litt. Honoris causa from the Andhra and Sri Venkateswara Universities. Prof. Iyengar is the author of over 30 books covering literary history, criticism, biography and education, and of numerous papers in learned journals. His 2-volume classic, On the Mother, received the Sahitya Akademi award in 1980. he has edited for Sahitya Akademi Guru Nanak: A Homage; Indian Literature Since Independence; and Asian Variations in Ramayana. "I don't know of another man", said Allen Tate, the American poet and critic, of him "who so gracefully combines penetrating literary insight with a sure sense of human values. Prof. Iyengar's verse publications include Tryst with the Divine, Microcosmographia Poetica, and Leaves from a Log. He has also published English vese translations of Devi Mahatmyam and Atma Bodha from Sanskrit, and selections from Tirumandiram and Tiru-arutpa from Tamil. The 'Sundara Kanda'-the seed-book or bija-kanda as it has been called, of the Ramayana of Valmiki-is here presented as an autonomous epic by itself, arranged under Seven Books. The verse form used is a 4-line unit in lieu of the Sanskrit onushtup sloka. I have attempted, however, neither a word-for-word translation, nor always a sloka-stanza correspondence. The span of though often overflows the quatrain mould, thereby softening the metrical monotony. I am aware that, in the process of translation from Sanskrit into English, the cadence and dhwani are inevitably lost. 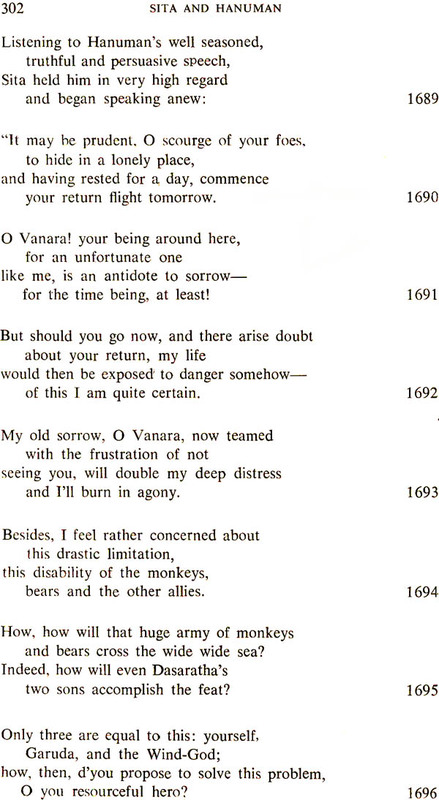 But I venture to hope that the general narrative drift and flow of meaning are retained, and also that some faint echo at least of the epic drama of Haunman's flight to Lanka, discovery of Sita, and return and report to Rama, come through even in my free and feeble English version. It is a pleasure to record my gratitude to Sahitya Akademi's President, Prof. Umashankar Joshi, Vice-President, Prof. V. K. Gokak, and Secretary, Dr. R. S. Kelkar, for sponsoring this publication; and Deputy Secretary (Programme), Sri Vishnu Khare, and Programme Officer, Sri Thambi Srinivasan, for Seeing the book through the press. Thanks are, finally, due to Sri S. P. Jain of J. Samanta Machinery Co. for producing this book attractively and in a short time. "The Itihasa was an ancient historical or legendary tradi- tion turned to creative use as a significant my thus or tale expressive of some spiritual or religious or ethical or ideal meaning and thus formative of the mind of the people".
" ... they wrote with a sense of their function as archi- tects and sculptors of life, creative exponents, fashioners of significant forms of national thought and religion and ethics and culture, A profound stress of thought on life, a large and vital view of religion and society, a certain strain of philosophic idea runs through these poems and the whole ancient culture of India is embodied in them with a great force of intellectual conception and living presentation" The Mahabharata, indeed, which was in the main a later work, is often referred to as the Fifth Veda; and like it, even the shorter and less proliferating Ramayana is called a Dharmashastra, a body of spiritual, religious, ethical, social and political teaching. The ancient seer-poets were not governed by any severely restric- tive "poetry for poetry's sake" heresy. Their vision was as large as life, and even transcended life and comprehended Man, Nature and God; and they were at once philosophers and poets, prophets and lawgivers. The twin epics thus came to be read and treas- ured, not alone as works of imperishable poetic excellence per- ennially providing enjoyment and edification to all sections of the people through the vivid presentation of significant personalities, character-conflicts, heroic and romantic actions, the play of the unpredictable, the co-existence of opposites, and of instances of Divine intervention and manifestation: not alone as such nobly articulate epic poetry, but equally as the distilled wisdom of Veda and Upanishad, Arthashastra and Dharmashastra. These Itihasas were, in short, meant to be a complete and universal and infallible education by themselves. "Vyasa's knowledge of character is not so intimate, emo- tional and sympathetic as Valmiki's; it has more of a heroic inspiration, less of a divine sympathy. He has reached it not like Valmiki immediately through the heart and imagination, but deliberately through intellect and experience, a deep criti- cism and reading of men ... "
"Here the Vedic notion of a struggle between the god- heads of truth and light and unity and the powers of dark- ness and division and falsehood is brought out from the spiritual and religious and internal into the outer intellectual, ethical and vital plane". 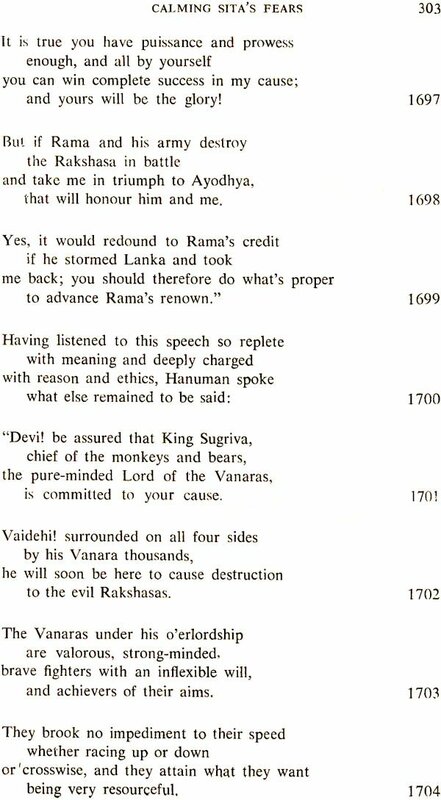 There is the personal struggle between the Pandavas and the Kauravas, between those that try to follow the higher ethical code of Dharma and those governed basically by Asuric egoism and perverted self-will; and there is a political struggle too, climaxing at sanguinary Kurukshetra and ending in the establish- ment of a new reign of righteousness: "It is the old struggle of Deva and Asura, God and Titan, but represented in terms of human life". If the Mahabharata is verily like the Himalayas, peak after peak facing one another and the entire range. imperious and overpowering, the Ramayana is rather like the Ganga sustaining the popular culture of the people as their unfailing spring of living waters. Compared with the Mahabharata, the Ramayana has "a greater simplicity of plan, a more delicate ideal tem- perament and a finer glow of poetic warmth and colour ... There is less of the philosophic, more of the purely poetic mind, more of the artist, less of the builder ... The subject is the same as in the Mahabharata, the strife of the divine with the titanic forces in the life of the earth, but in more fiercely ideal forms, in frankly supernatural dimensions and an imaginative heightening of both the good and the evil in human character. On the one side is portrayed an ideal manhood, a divine beauty of virtue and ethical order, a civilisation founded on the Dharma ... on the other are wild and anarchic and almost amorphous forces of super- human egoism and self-will and exultant violence". "The poet makes us conscious of the immense forces that are behind our life and sets his action in a magnificant epic scenery, the great imperial city, the mountains and the ocean. the forest and wilderness, described with such a largeness as to make us feel as if the whole world were the scene of his poem and its subject the whole divine and titanic possibility of man imaged in a few great or monstrous figures. The ethi- cal and the aesthetic mind of India have here fused them- selves into a harmonious unity and reached an unexampled pure wideness and beauty of self-expression ... lent a cer- tain high divineness to the ordinary things of life, conjugal and filial and maternal and fraternal feeling, the duty of the prince and leader and the loyalty of follower and subject, the greatness of the great and the truth and worth of the simple ... The work of Valmiki. has been an agent of almost incal- culable power in the moulding of the cultural mind of India: it has presented to it to be loved and imitated in figures like Rama and Sita, made so divinely and with such a revelation of reality as to become objects of enduring cult and wor- ship, or like Hanuman, Lakshmana, Bharata the living hu- man image of its ethical ideals; it has fashioned much of what is best and sweetest in the national character ... "